"A crispy tart-n-sweet recipe that is easy to make and a great way to use all that delicious rhubarb." 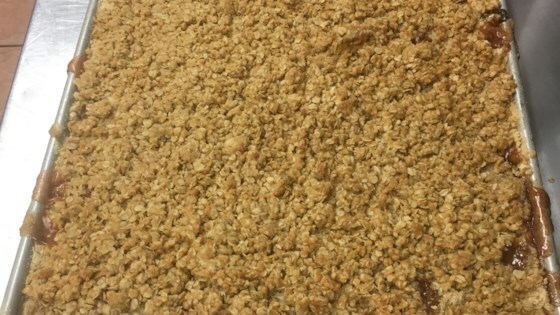 In a large bowl, mix together oats, brown sugar, flour and butter. Put half of the mixture into the bottom of the baking dish. Place rhubarb over top of mixture and sprinkle with cinnamon. In a medium saucepan, cook water, sugar, cornstarch and vanilla over medium heat until thick; let cool slightly. Pour over rhubarb and sprinkle remaining oat and flour mixture on top. Bake in preheated oven for 30 to 35 minutes. We have contacted the submitter of this recipe, and there was a typo in the amount of butter. We have changed it to 1/3 cup. We apologize for any inconvenience. This is wonderful! The crust is yummy...I had plenty of it, and used some of it on top of an apple pie. I highly recommend trying it, especially for someone who's never eaten rhubarb before.